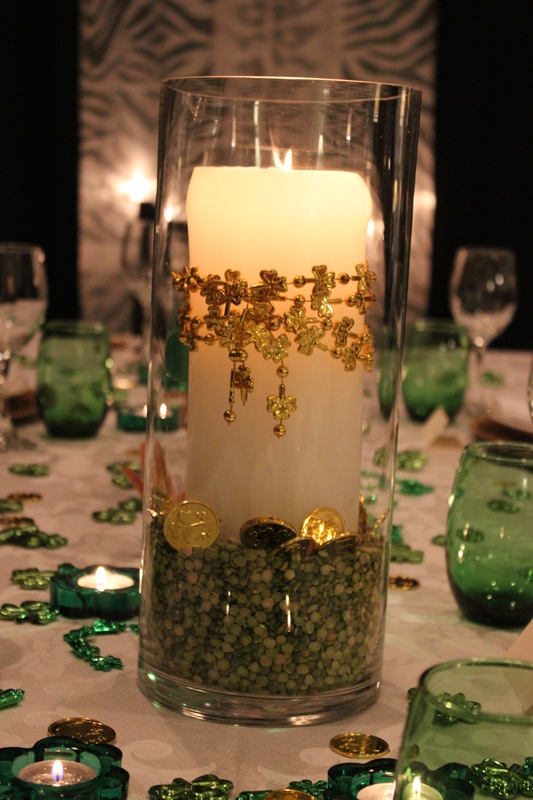 I created this lighthearted, inexpensive tablescape to celebrate St. Patrick’s Day. 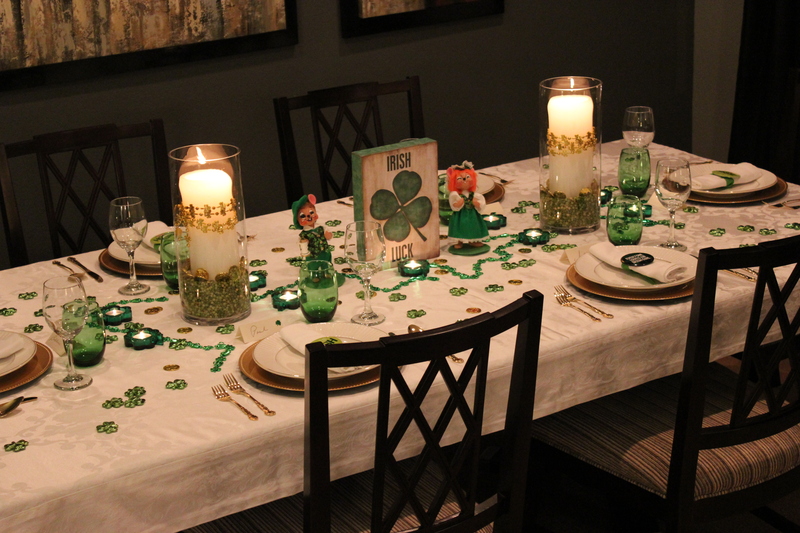 I mixed green and gold items found at our local Dollar Tree, Homegoods, and Michaels. 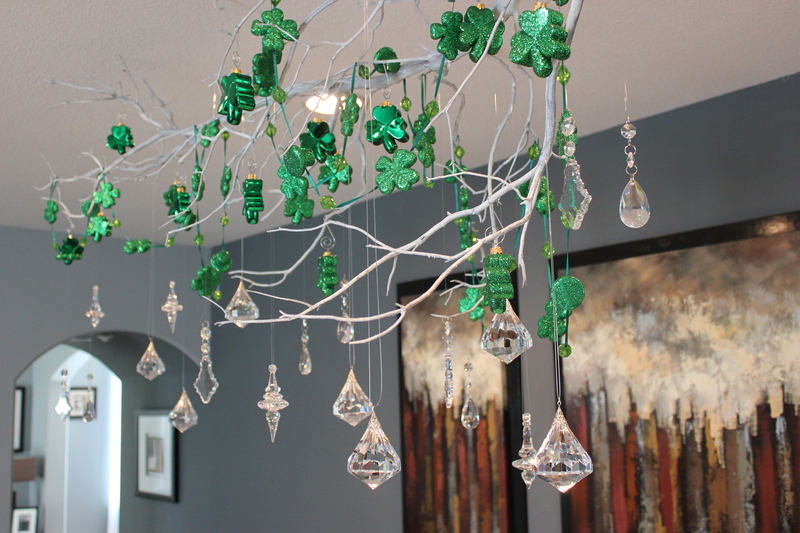 With spray painted branches anchored above the ceiling with monofilament, it works perfectly as an inexpensive “chandelier” with crystals, four leaf clover garland, and a few glitter ornaments. 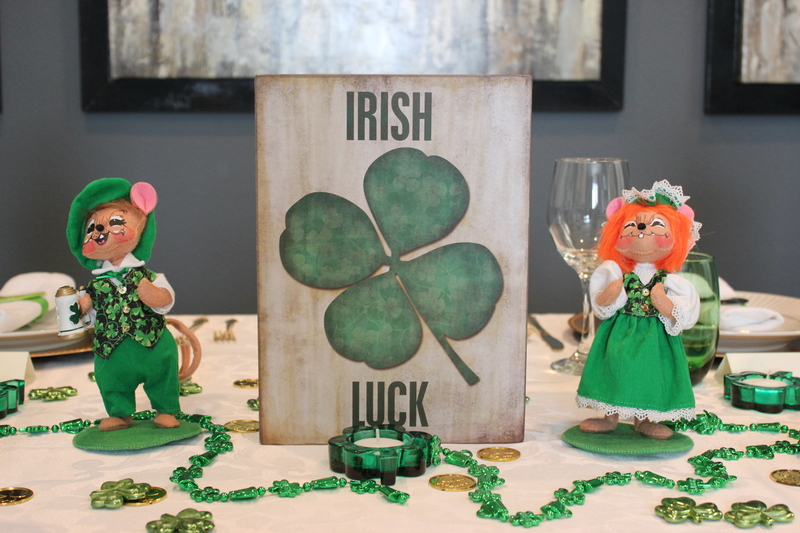 At Homegoods, I Found this fun little wooden sign “Irish Luck” and flanked it with two festive Irish mice figurines. 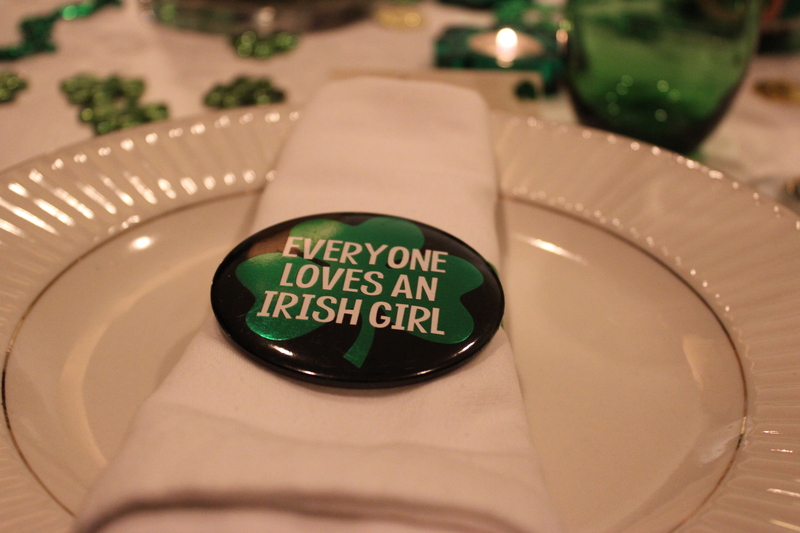 “Everyone Loves An Irish Girl” Anyone can be Irish for a night with this button turned into a napkin ring by simply tying a green ribbon around a napkin and pinning the button to the front. 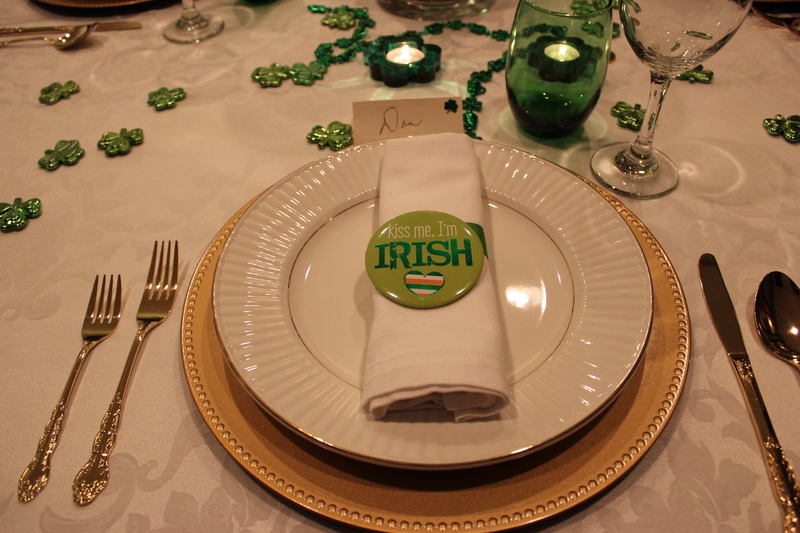 Of course, the men have their button too with “Kiss Me I’m Irish” on them. 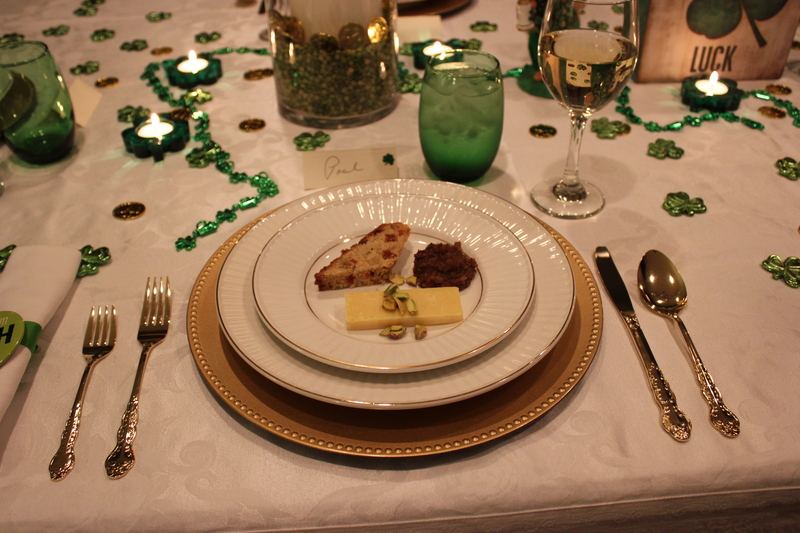 With gold chargers, gold trim plates, and gold flatware, my guests will be feeling wealthy indeed! 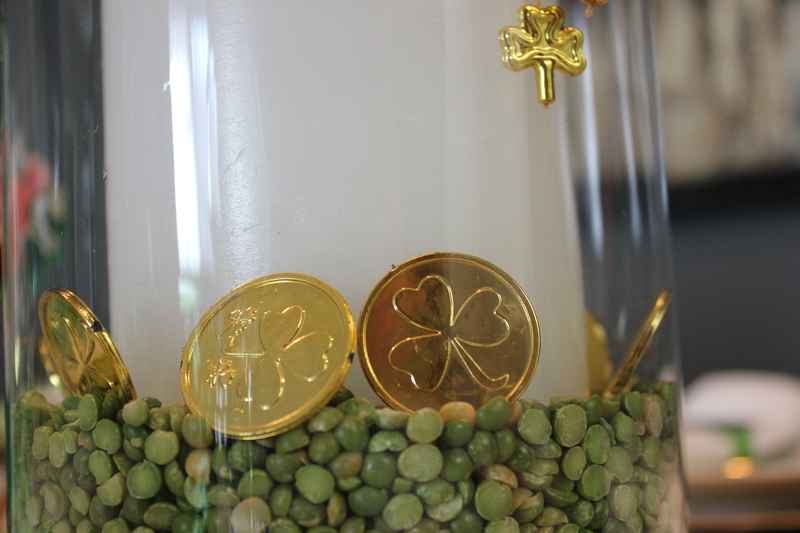 And speaking of wealth, it wouldn’t be right not to have a bit of gold coins for a pot of gold. I found packs of gold coins through Oriental Trading Company. 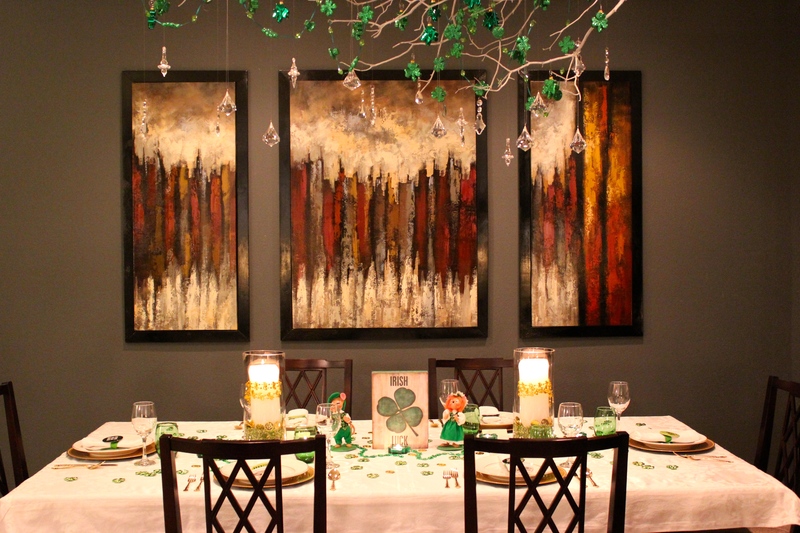 The soft glow of the candles illuminates the table during dinner. 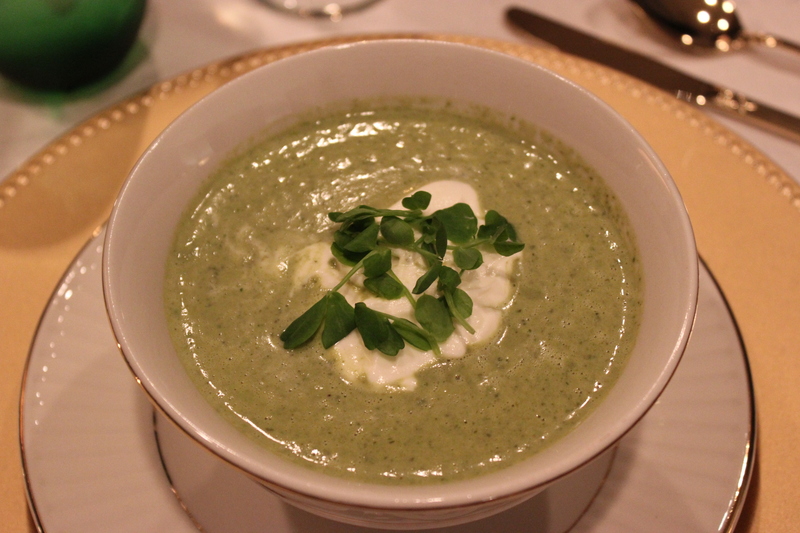 I always try to come up with some interesting vase filler, and this time, I used green split peas I found in my pantry. But don’t worry, I certainly won’t be cooking them after the holiday. 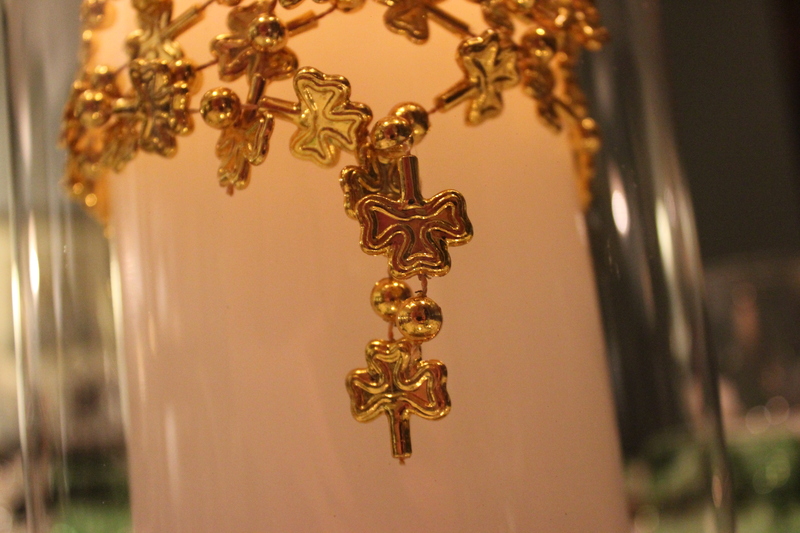 As a reminder of St. Patrick, I attached gold cross garland to the candles with brass finishing nails. 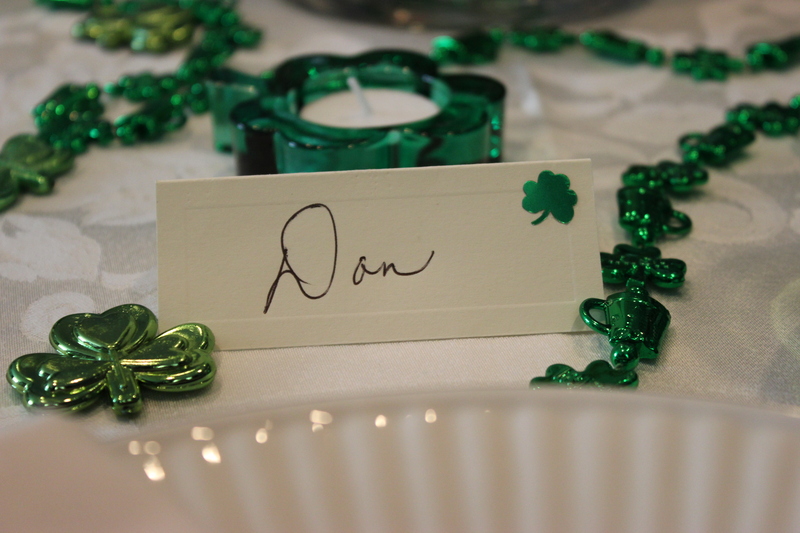 “Danny Boy” has a place setting just for him, with a green foil sticker on his name card, four leaf clover table scatters for luck, and green glass clover tea light candle holders found many years ago at Terry’s Village. 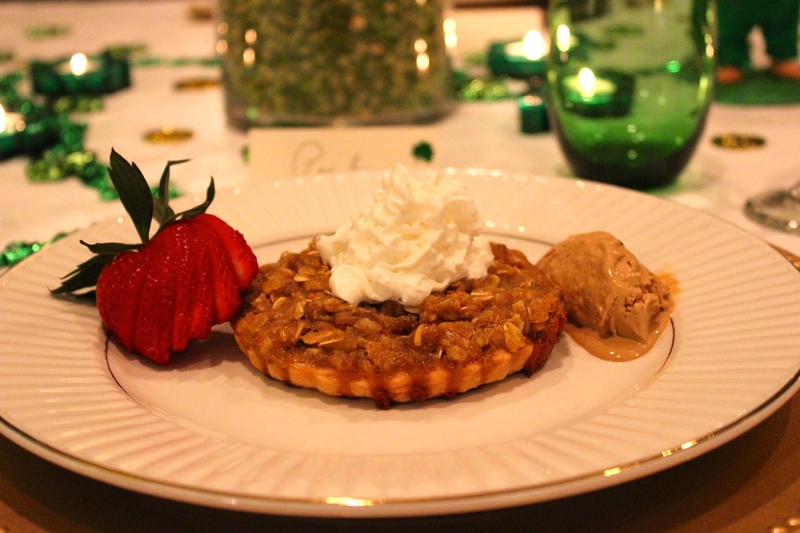 And can you believe it?! 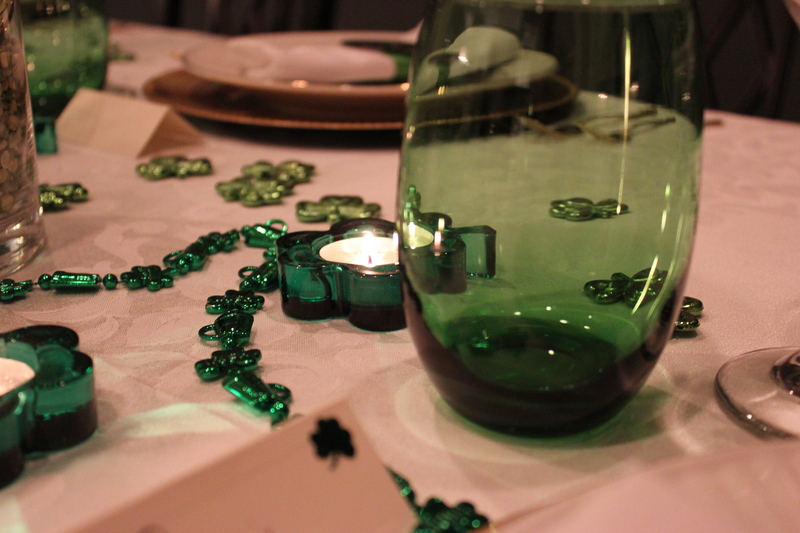 These beautiful green water glasses were found at Dollar Tree! Yep, that’s right, only a dollar each. 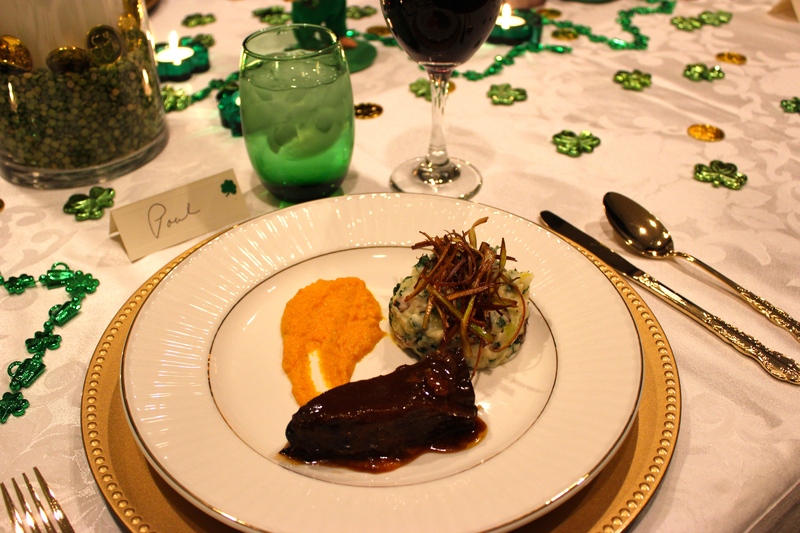 Now it’s time to celebrate St. Patrick’s Day with an emerald isle inspired menu. 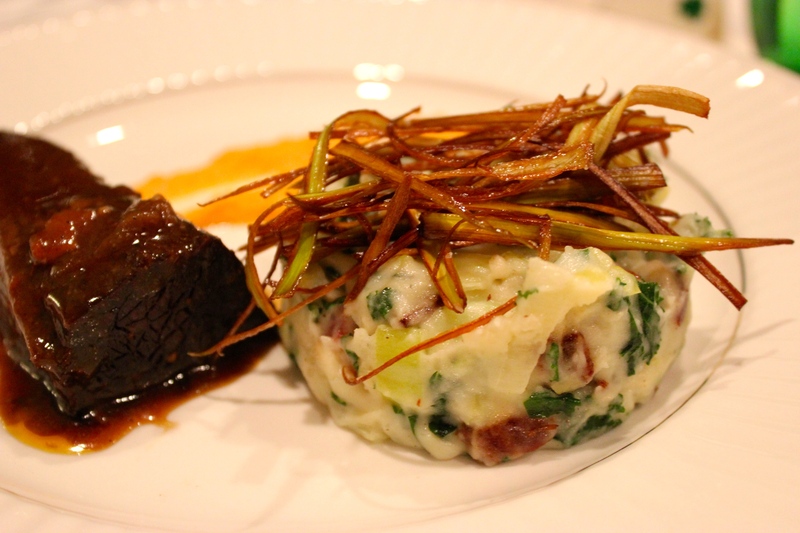 Main Course: Guinness Braised Venison Bottom Round with Colcannon and Frizzle Leeks, and Caraway Seed Scented Carrot Puree.